Whether you or your family members are students looking for ways to get a head start on earning a high credit rating, or whether your an experienced borrower who just hasn't given it much thought, it's a good idea to refresh yourself every so often on the behaviours that lead to a high credit score. Not only is a good score beneficial to you in and of itself, but it can also indirectly lead to better insurance rates for you, so it really pays to know what these behaviours are, and to put them into practice. Open a credit card – if you're just starting out, this is the simplest way to begin. By opening a credit card, you can start demonstrating, on a low scale, that you are able to pay for what you have borrowed in a timely way. Spend wisely – while your credit card may be your first foray into the world of credit score building, it could also be your nemesis if you don't use it properly. Experts recommend that you aim to charge ten percent of your limit, and try not to exceed thirty. However, if you do exceed that suggested amount, be prepared to make your payment right away. Check your statements – this may sound obvious, but sometimes when we get busy, little things like checking statements can fall through the cracks. However, this is actually really important to do because of the prevalence of credit card fraud. More than likely, there will be at least one occasion in your credit card using life when an instance of fraud occurs on your card. If this is a card you seldom use, you may not know this, and those missed payments may count against you if the credit card company does not know those charges are fraudulent. While credit card companies are very good at catching fraudulent activity even before you notice it, there are some transactions of this kind that they don't catch, so do your part. Don't close an unused account – even if you're not using a certain credit card, don't take it upon yourself to close it. Keeping it open will contribute to a higher score. Pay bills on time – this refers to bills of every kind. By making your payments when they are due, you won't necessary raise your score, but you will protect it from the points you would inevitably lose if you were consistently late with payments. Have a variety of debts – of course, it goes without saying that you should not sign up for more debt than you can manage. However, borrowing from a variety of sources will help increase your score. An example of this would be having a credit card, and having a car loan. safely pull off the road, and park about 30 metres away from the collision. Turn on your emergency lights. approach the site of the collision and check to see if anyone is injured without touching anyone involved. Try to understand the events so that you are prepared to report your observations accurately. phone 911 and tell them your reason for calling. You will be directed appropriately. Be prepared to supply your contact information, as you will likely be contact for details as to what you saw and heard. Give us much detail as you can about the accident location. This may not seem critical to do in a timely fashion if nobody has been hurt, but if there are injuries, it is imperative that paramedics arrive as quickly as possible. Try to stay as calm as possible so that you can think clearly, and direct response teams to the accident location quickly and effectively. Wait for the 911 operator to confirm that they have all of the information required of you before hanging up. Don't rush to get off the phone before all of their questions have been answered. This could cause unnecessary delays in their ability to respond. Do not agree to direct traffic around the accident. For one, this puts you in harm's way physically. For another, you could be held responsible for any subsequent accidents that could be blamed on your directing. Unless you are a physician, nurse, or paramedic by training, do not move any of the injured parties. It is very easy in circumstances like these to actually cause more harm and exacerbate injuries simply by trying to make the casualties more comfortable. Wait for the paramedics to arrive; they'll be able to do their best without interference. Be prepared for future contact in case further details are needed later on. stove top – leaving the stove unattended is one way to cook up disaster—no pun intended. Despite that you may have made sure to leave the heat low, there is always a chance of liquid bubbling over, or debris somehow being blown into the burner element. If this happens without your knowledge of it, a fire may start in a matter of seconds. This is particularly true if oil is involved. Moreover, even if you have a small kitchen, you really should resist the urge to use your stove top as additional counter space. You may think you are being careful to check if it is hot before placing an item on it, but the fact of the matter is that we all get distracted from time to time, and carry out our work on autopilot. If you're using your stove top as a counter, there will come a time when you place something on it when it isn't safe to do so; and if that something is flammable, the damage could be substantial. Oven – similarly to the stove top, this should not be left on unattended. Despite that you've got errands to run, and baking times can be long, stick around when you're expecting to bake something. Don't dismiss smells of burning. While they are usually harming and owing to the burning of crumbs at the bottom of the oven, this isn't always the case. Monitoring your oven from time to time is important when it's in use. Also, if you are a user of parchment paper, be careful to not let the paper come into contact with heating elements. Candles – unattended candles are one of the leading causes of home fires. You should never turn your back on an open flame—even for a minute. If any tremor or movement in your home knocks the candle over, or if a flammable item falls on or beside it, it won't take long for fire to catch. Power cords – frayed, worn out, and damaged power cords are definitely a fire hazard. This is especially true if the exposed wires of these cords are in contact with your carpets or any other type of fabric. If you have pets, be sure to keep cords out of their chewing range. When you notice any damage at all to a cord, discontinue its use immediately and replace it with an undamaged one. Appliances – faulty appliances, such as hairdryers and toasters, can emit sparks that will trigger a fire in a matter of seconds. If you know that an appliance is damaged, don't use it. In all likelihood, scores (if not hundreds) of graduate students have very probably written dissertations on the topic of the psychology of driving. Our brains seem to function in a completely different way when we're behind the wheel than when we're at the office or in our homes. At the risk of trying to reduce everything in life to Batman, there's a little bit of Two-Face lurking in all of us: when we're on the road, we tend to engage in language and behaviour that—in the rest of our lives—is off limits. What accounts for the disparity between our driving selves and our rest-of-the-time selves? One major factor in the release of inhibitions on the road is anonymity—both of the driver, and of those whom the driver perceives. Although it isn't necessarily a conscious effort on the driver's part to think of themselves as anonymous, the very nature of the physical barriers of their car and of those around them automatically cue their brains to say “I'm invisible right now.” That anonymity can be dangerous: when you cease to realize the extent to which you are accountable to those around you, it's possible to become destructive and opportunistic if that seems to be a way to get what you want. (You see this phenomenon frequently in the way that people behave online as well). The other way that anonymity plays a role in this scheme is the driver's perception of those sharing the road. Again, the physical barriers both of your vehicle and theirs function to suppress your ability to recognize them as a person, rather than a vehicle. This would account for why you might cut them off without so much as a shred of embarrassment, while you never dream of cutting in front of the same person in queue at the supermarket. (This is not to say that there are not people who would do both, but rather to highlight that most of us are more at ease with misbehaving when we can't be seen). When we find that we are driving in a way completely discrepant to the manner in which we conduct the rest of our lives, it is worth pausing to remember ourselves, and behave like ourselves. vinegar – once you discover how effective vinegar is, you'll use it for just about everything. It's cheap, and completely ecologically sound. baking soda – when a little bit of abrasion is needed, you'll be hard pressed to find a less expensive or greener choice than baking soda. olive oil – when was the last time you heard warnings about the effects of olive oil on your health, or on the environment? lemon juice – if it's good enough to put in your body then it's a treat for your car. liquid castille soap – this is made from olive oil, and is one of the gentlest soaps out there. beeswax – not crucial, but it doesn't get much more natural than that when it comes to polishing your car. Newspapers – recyclable, biodegradable, and often, free. bucket – reusable, low cost. scrub brush – reusable, low cost. spray bottle – reusable, low cost. Sponges – reusable, often biodegradable, and low-cost. Rags – reusable, biodegradable (depending on the material), and low-cost. Use a mild solution of castille soap and water to remove dirt. Use ¼ cup melted beeswax mixed with ½ cup olive oil to polish it. Dry newspapers work best if there isn't heavy soiling. Otherwise, precede the newspaper step by spraying undiluted vinegar on the windows, and letting it sit for 5-10 minutes. Using a 1:1 ratio of water to vinegar, use a rag dipped in this solution to wipe chrome. To apply the solution to hard to reach areas, use a spray bottle. Add enough water to baking soda to form a thick paste, and apply it to your tires. Use a scrub brush to move it around, then rinse with straight water (like brushing your teeth). Light stains can be removed by applying a paste made of vinegar and baking soda. Let the paste dry, then vacuum it. Plastic and vinyl surfaces can be cleaned/protected using a 1:2 ratio of lemon juice to olive oil. Be sure to wipe the excess with a spare rag. Drive a fuel efficient vehicle – A while back, we discussed hybrid and electric cars. If you're in the market for one, go ahead and feel smug, but if not, there's still plenty of gas to be saved by driving a compact car during your daily commute instead of an SUV. Check your tires – underinflated tires actually use 25% more gas. That doesn't mean you should overinflate either though, because that comes at its own cost: wearing your tires out more quickly. Get a gauge and check your tire pressure to make sure you're at the right pressure level. How do you know what the right tire pressure is? Especially when your car door says one thing and your tires say another? Rule of thumb is: go by what the car door says. Lighten up – That massive shopping you did at Costco the other day? Don't delay in unloading it! Bring in those club packs of canned beans and those industrial sized bags of rice and sugar. Why should they get a free ride? Cool! - Here's a “cool” (pun intended) fact: fuel is densest at the coolest time of day. So if you fill up when it's cooler outside, you'll actually be packing more fuel into your tank than if you fill up at high noon. Put a lid on it – check your cap to make sure it's tightened properly. It's very common for people to lose gas in vapours that escape through caps that aren't properly tightened. If you haven't heard it click yet, keep turning. Drive the limit – limits aren't just safe; they're economical too! Driving over 100 km an hour can actually reduce your fuel efficiency by as much as 33%. In fact, every 8 km over the limit that you drive is like paying an extra $0.08 per litre of gas. Use cruise control – For long distance driving, when you are in charge of acceleration, you are going to fluctuate. This is because you are not a machine. If you let your cruise control do the accelerating and decelerating for you, you know it will be using only exactly the amount of gas it needs to precisely maintain the limit. Stop and start gradually – driving at high speeds in spite of impending stops, only to screech to a halt is actually a pretty good way to waste gas. So is flooring the pedal as soon as it's your turn to go. By taking the starts and stops gradually, you waste less gas on unnecessary acceleration. Maintain your vehicle well – An engine that is properly tuned can actually save 4% in gas costs. That's substantial! It's worth visiting a mechanic for this one. As with most efficiency related strategies, there may be a cost upfront (taking your vehicle to the auto shop) but there will be continuous payoff thereafter. Don't forget the spark plugs either—if they're not in shape, you could be losing as much as 12% in your mileage. Another gas waster is a dirty air filter. An air filter that needs changing can reduce your mileage by 20%. Don't sweat it – contrary to popular belief, driving with the air conditioner on doesn't actually waste much gas at all, so if that comfort will help you drive more smartly, you can turn it on without feeling guilty about it. Don't deliberately drive over sharp debris if it can be safely avoided...an ounce of prevention is worth a pound of cure. Don't swerve around debris to avoid it if it puts you into oncoming traffic or in the path of cyclists and pedestrians. That would be trading up from a moderate problem (flat tire) to a more serious one (collision). Do briefly do a visual check of your tires before embarking on any trip so that if you do have a flat, it doesn't come as a nasty surprise. This takes seconds, literally, so it's not something you have to build extra time into your commute for. Don't take off for work or home—especially if it involves highway driving—knowing you have a flat. 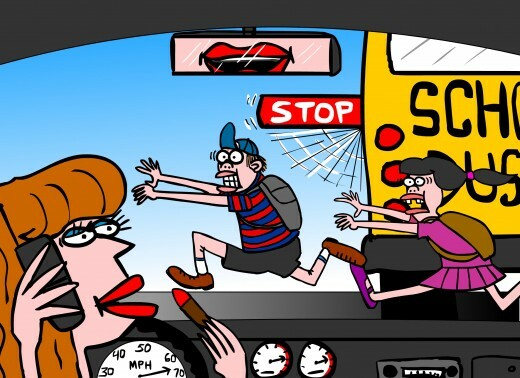 Doing so increases the risk of you being involved in a collision. It's also damaging to your wheels. Do pull off the road gradually and safely when you realize that you are driving with a flat tire. Do check your spare to ensure that it is adequate for replacing any flats you may encounter. Sometimes it is the case that the spare itself is damaged, which leaves you in a bind if a flat does happen. Do re-stock your spare once you've used the old spare to replace a currently damaged tire. Don't assume that the damaged tire can be patched up and re-inflated. If it is a slow leak, then there is a good chance that repair and re-inflation will be adequate. However, if there is a puncture to the tire wall itself, or if it is an issue of the tire tread wearing out, then replacement will be necessary. Don't assume you have a flat simply because you drove over debris, especially if there are no signs of deflation. Sometimes debris may just leave an impression in the tire without actually puncturing it all the way through. If there isn't any air leaking out, then there isn't a need to replace the tire. Do check your valve system to ensure that there aren't any leaks there. Do keep a gauge in your glove compartment to periodically check your tire pressure, and ensure that your tires are inflated at the recommended levels indicated on your vehicle doors. Making a habit of doing this at a gas station will allow you to adjust your tire pressure as soon as you notice it is off, decreasing the likelihood that you'll forget to adjust it later. The Alberta Health Care Insurance Plan is the basic health care coverage provided to residents of Alberta. In order to be financially prepared for all health-related situations you may find yourself in, it's important to know the basics about what AHCIP covers, and what it does not. While several items listed under things that AHCIP does not cover may not be of concern to you, some of them will be. For this reason, it is important to carefully consider the items services you need in order to select the best health insurance policy to meet those needs. With the current outbreaks of E. Coli in Alberta, it would be a good idea to familiarize yourself with the basics of this infection. E. Coli refers to Escherichia Coli, a bacteria that is found in the intestines of most healthy people and animals. When you hear talk of an infectious type of E. Coli, this refers to a strain of the bacteria identified as E. Coli 0157:H7 . This is the illness-causing strain that most of us have heard of. While we typically think of cattle when we think of animals that may carry the infectious strain, it has also been found in deer, sheep, goats, and other animals. How long has E. Coli been around? E. Coli was first identified in 1982, when an outbreak causing illness prompted research. The findings traced the bacteria back to hamburgers that had the 0157:H7 strain in them. This really varies from individual to individual. Some infected people are completely asymptomatic. For those that do have symptoms, they range from mild diarrhea, to severe diarrhea that is accompanied with blood. Symptoms of nausea and vomiting are common as well. Fever is not a good indication of infection in this case, since there is usually only a mild fever or none at all. E. Coli in and of itself is not a deadly infection. However, with complications it can be. This would not be the case in a typically healthy individual though, and is not very common. Who is at risk for contracting E. Coli? While E. Coli infections can affect anybody who is exposed to the bacteria, those who are elderly, as well as children under the age of five, are at greatest risk. How does a person catch E. Coli? The most common means of getting E. Coli are through the consumption of undercooked meat, drinking unpasteurized milk or juice, swallowing contaminated water (drinking water, pool water, natural bodies of water), or by eating raw leafy vegetables (like spinach or lettuce) that has been contaminated with E. Coli. Are people infected with E. Coli contagious? Since human waste carries E. Coli in it, if an infected person neglects to wash their hands well, they can be passing along the infection. Moreover, even long after an infected individual's symptoms have passed, they continue to shed the bacteria in their waste, so proper hand washing is important even long after the symptoms have subsided.